From within Japan dial: 097 575 2150 (retreat) 090 9496 0648 (Jiho’s personal cellphone). Checkin/Checkout time: 8am – 9pm. Don’t plan to arrive later or earlier. We do our best to pick up all our guests from Kōzaki station, but it’s not always possible. We will tell if we are able to pick you up when you call us from Kōzaki station, not before. We cannot tell you definitely until the day you arrive. If its not possible, its just a short taxi ride, so please don’t worry too much about knowing in advance. Someone will be there to receive you either way. 1. We strongly recommend that you print this page and carry it with you while you are traveling. It may be useful at customs when entering Japan, explaining to Japanese speaking people where you are going, and most importantly, arranging transportation once you arrive at the nearest train station to the retreat. (Kōzaki station, 30 minutes from Ōita central station.) Please be sure you have also first read the Getting Here page of our website carefully. It provides essential information about making your way to our retreat and planning your travel to and within Japan. 2. Checkin/Checkout time: 8am – 9pm. We ask that you do not arrive for checkin or call for pickup before 8am or after 9pm. Apart from this, there is no strict check in or checkout time, although we ask that you show courtesy and consideration to other guests on your arrival and departure day. 3. 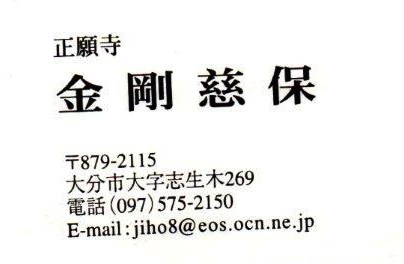 Essential contact information: Land line at the retreat: 097 575 2150 Jiho’s personal cellphone: 090 9496 0648 The business card for the temple is shown below and is absolutely necessary if you decide to take a taxi from Ōita or Kōzaki to the retreat and you don’s speak Japanese. May also be useful at customs and immigration when entering Japan or if you get lost while exploring the towns and villages around the retreat. 5. Taking a Taxi from Kozaki station to the retreat: Occasionally, we may ask you to take a taxi from Kōzaki to the retreat upon your arrival. This will cost you about $15USD. This would only happen if retreat staff are unavailable to come and get you. Its a very good idea to have a copy of the business card shown above with you to show the taxi driver to avoid confusion. You should only take a taxi to the retreat if you have just called us and have been advised to take a taxi (or if you are already checked in and know your way around the retreat). If you are a new arrival, please do not show up unannounced. There may be no one at the retreat to receive you and there is no public telephone near the retreat itself. 6. Please try to inform us in advance of approximately what time you will be arriving at Kōzaki station. Use hyperdia.com to determine your train route and times (searching for “Kōzaki (OITA)” as your destination) . We do not need the exact time, rather we need to know the approximate time of day you will arrive so that we can be sure someone will be readily available to come and pick you up at Kōzaki station quickly and with a minimum of wait time. 7. If you cannot reach Jiho by phone on your scheduled arrival day (very unlikely), we recommend that you be patient and stay at either Kōzaki or Oita station. Please do not show up at the retreat unannounced. There may be no one at the retreat to receive you and there is no public telephone near the retreat itself. Jiho may be at a different location waiting for your call or temporarily unable to answer if he is performing some professional duty. 8. Please feel free to contact me, the site administrator, Pierre Black (pierrefergusonblack@gmail.com), for any assistance before as well as during your stay. I can help you optimize your travel plans to and within Japan, answer any questions or concerns you may have about planning your stay, and even sort out any communication issues during your stay in the unlikely event that this would occur. No question or problem is too small. Unfortunately, however, I cannot be instantly available at all times. Also, I am often in a completely different timezone, maybe on the other side of the world! I usually follow up on all communication within 24 hours. If not, please do not hesitate to send another email, or try my alternate email address (pierre@pierreblack.org). If I still do not respond within 24 hours, there is probably a good reason for it. I will do my best! I am here to make this trip a wonderful experience for you and do my best to be attentive and responsive to your needs. I want you to have the best possible experience in this very special place. 9. By booking a stay at Shōganji Zen Retreat and choosing to stay at Shōganji Zen Retreat you agree to and consent to the Zen Retreat Waiver of Liability. April 21 – 30, 9 nights, one guest. May 17-26, 9 nights, one guest. May 20-25, 5 nights, one or two guests. June 4-14, 5 or 10 night options, one guest. June 27 and later, unlimited. We typically fill up 2-3 months in advance. Book now to guarantee your stay! We are closed every January and February. We are open every March through December. Availability/cancellations updated daily. I’m Pierre Black, Zen Retreat’s Online Coordinator. I’m a naturopath and healer, and I presently operate my own retreat in Chiang Mai, Thailand, The Middle Path retreat. When I’m at Zen Retreat, I teach yoga, cook, and help facilitate the Shōganji Zen Retreat experience for guests. If you would like more personalized live assistance toward planning your trip, meditation coaching, or additional preparation for your time at Zen Retreat, we can arrange a live video session together. Click Here to schedule your live video session.